Cyndi arrived at my door looking a bit like a determined traveling salesperson, carrying cases and bags of various sewing equipment. But she wasn’t there to sell me something, she was there to rescue me. Relief flooded me. Not only does Cyndi know how to sew, she knows how to survive. She knows what matters. She has perspective. Of course I didn’t mind. Let’s all discard our wigs and get to work. In case you’ve always wondered, too, from what I can tell it’s a straw-that-broke-the-camel’s-back moment. I’ve been carrying around all this weight for two months now—buying and trying to sell houses, the chaos of moving, two spring yards to care for, a cloud of financial and parenting stress, and more client deadlines than I’ve had in years. 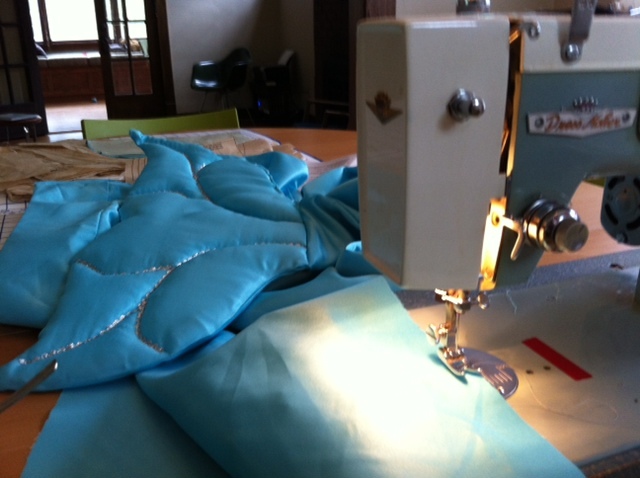 Then, on Saturday morning, I sat down to face my task for the day: sewing a mermaid costume. I’ve done some sewing back in the day, when I was maybe 14 and my mom was right there to assist with all the tricky parts, but this pattern? It’s geared toward wedding dress makers, and grandmas who’ve been sewing for 60 years and have empty days’ worth of time on her hands. It’s a pattern designed specifically to challenge the advanced-Ninja seamstress. I felt like I was stumbling through a dangerous dream, trying to read ten foreign languages while deciphering 100 crinkly, crumbling maps that would never again be neatly folded and tucked away. Somehow—by the grace of God, I can only assume—I stopped sobbing and started pinning, cutting, pressing, and sewing. Some of my sewing skills came back to me, but for the most part I was just winging it, half following the directions and half making it up as I went, skipping the boning (boning!) and lining and other things I didn’t understand. By the end of the day I had held myself together as long as I could, and I had done as much sewing as I could. There were still not one but TWO zippers, a fitted yoke for the top of the skirt/tail, hems, and some other finishing work to do. I was completely spent. And the costume was “due” Monday. This is where Cyndi came in. She was at my house Sunday afternoon for three or four hours, basting in zippers, laughing at the indecipherable pattern instructions, and chatting away about her grown sons, the graduate program she’s in, and her plans to ditch the wig and dye her new hair red. We worked in tandem. While one of us was at the sewing machine, the other was a the ironing board or pinning pieces of slippery blue fabric in place, then we switched. When it was all said and done, Cyndi gave me a lot that day. She gave not just skilled help and instruction, but also moral support. She even gave me freedom from guilt, as she said more than once how much fun it is to sew with someone, and how happy she was to be done writing papers and to have something fun to work on. We got to know each other in a way we haven’t had a chance to in the past. And I was able to set aside all that’s been weighing on me, because I was able to see how insignificant it all is, in the scope of things. I was able to see that I’m not alone, even in the most unexpected of moments and ways. After I began writing this post, I realized it’s the first week of the month—time for a One Word Update. (My word for 2013 is “openness.”) I generally don’t like shoe-horning an idea into an existing form, after the fact, but then I realized how much this experience really is about openness. From my ability to let go of my pride and ask for help from someone I didn’t know well, to Cyndi’s openness to take off her wig and give of her time and skills, we were open together, and that openness gave us both gifts. Oh, and a pretty-darn-awesome mermaid costume, too. All I can say is it better be awesome. Oh, how I love this! You and Cyndi demonstrated openness to each other in such beautiful ways. And as someone who’s done a fair amount of sewing, my head was swimming after reading all this mermaid pattern required. I totally would have broken down. Thanks for the love and the empathy, Leigh! I love this post, and the image of you and Cyndi spending that afternoon together. And asking for help can be such a difficult – and valuable – kind of openness. You would think by now, as grown women, we would be more accepting of our need for help! But I’m beginning to think we might always struggle with this—especially when we need help with something we think we should be capable of on our own. I’m tracking with you and felt relieved to read this. This touches on one of my greatest personal challenges: asking for help. I am so darn stubborn and prideful, and odds are I could accomplish so much more — and in a much richer way as you did with Cyndi — if I’d just ask for help more!